The RIPE NCC is 20 years old and it now has over 8,000 members. In this article we are looking at the growth curve and the composition of the membership: what industry do RIPE NCC members come from today. The RIPE NCC became the first Regional Internet Registry in September 1992 (six months after it was set up as the secretariat for the European operators community, RIPE). During the course of 1993, the distributed IP allocation system was established in which Local Internet Registries (LIRs) received blocks of IP addresses from the RIPE NCC which were then further assigned to their customers and others who wanted to connect to the Internet. By the end of 1993, there were 83 LIRs registered as members of the RIPE NCC. Most of these LIRs were operated by academic networks and the first commercial ISPs that started around that time in some European countries. Now, 20 years later, 8,000 members are registered with the RIPE NCC (March 2012). The RIPE NCC's membership has been steadily growing since 1998 when it passed the 1,000-member milestone, followed by 3,000 in 2001 and 6,000 in 2008 (as you can see in the graph below). 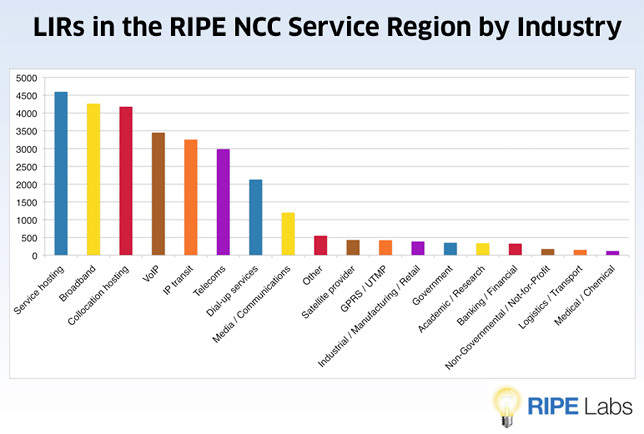 It is interesting to note that despite the fact that IPv4 is becoming very scarce, we still see a large number of organisations join the RIPE NCC. In fact, in the first quarter of 2012, we saw the highest number of new membership applications ever. In 2011, we experienced the highest growth since the dot com bubble around the year 2000. Also, that the graph only shows the number of LIRs that were active at any point in time. It doesn't show any of the members who closed in the meantime (if we counted every registry ever opened, we would be looking at a total of over 13,000). In the graphic below, you can see which industry area our members are from. Note that this is a self-chosen category and it is possible to choose more than one category. Organisations that provide the following services are highest on the list: service hosting, collocation and broadband. But Telecom operators, dial-up service providers and transit providers also make up a big portion of the RIPE NCC membership. There are also quite a number of government institutions are members of the RIPE NCC. Local Time: Tuesday, April 23, 2019 09:39 PM PDT – Page Load: 0.2638 Sec.